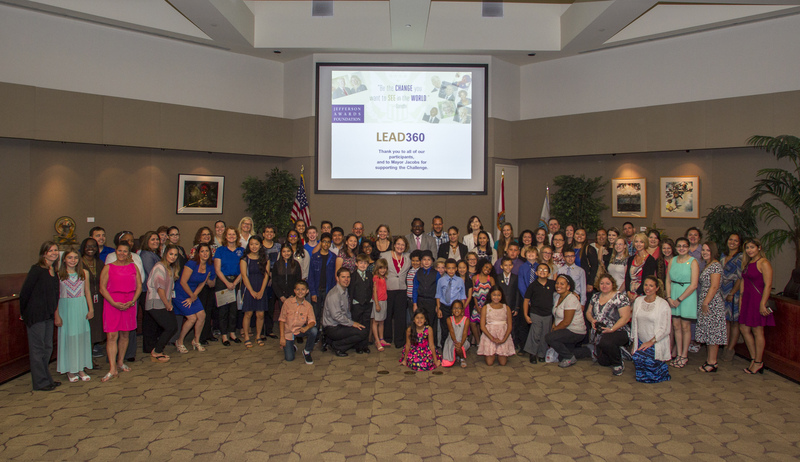 Orange County Mayor Teresa Jacobs recently recognized a group of young citizens in Central Florida who participated in the Jefferson Awards Lead360 Challenge. The program engages and celebrates America’s youth for their efforts in making a difference and inspires young people to coordinate and participate in public service projects in their community. The Jefferson Awards, founded by Jacqueline Kennedy Onassis, U.S. Senator Robert Taft, Jr. and National Development Council Chairman Sam Beard, is the country’s longest standing and most prestigious recognition system dedicated to activating and celebrating public service. West Orange High School’s Warriorthon project was named the Mayor’s Top Project by the Orange County’s Citizens’ Commission for Children. Warriorthon, an initiative of the Student Government Association at West Orange High School, was held in partnership with the University of Central Florida and helped raise money and awareness for the Children’s Miracle Network. Their efforts culminated in an event that had students on their feet dancing, playing games and other various activities for 10 hours. West Orange High School exceeded their fundraising goal of $10,000 and raised more than $18,000. Altogether, the efforts of these students and teachers from Orange County engaged 6,000 volunteers and generated a financial impact of more than $320,000 within the community. To view a collection of photos from the event, visit Mayor Jacobs’ Flickr album.